Harvey Milk—charismatic, eloquent, and a smart-aleck—was elected to the San Francisco Board of Supervisors in 1977 but had served for less than one year when he was shot by a homophobic fellow Supervisor. Milk’s assassination made him the most famous gay man in modern history, and countless tributes including a posthumous Medal of Freedom honor his legacy. This compelling biography explores the complexities of Harvey Milk’s life, from his Jewish childhood on Long Island to his final years as a progressive politician committed to social justice. As a Jew and a homosexual, Milk felt himself to be doubly an outsider. He was an energetic champion not just of gay people but also of racial minorities, workers, women, the disabled, and senior citizens. His politics were influenced by his Jewish cultural identity and the ideals of Jewish liberalism as much as by his gay identity. •Named "Most Valuable Biography" and called "a brilliant rumination on the revolutionary political journey of Harvey Milk" in The Nation's "Progressive Honor Roll 2018"
"Faderman does a fantastic job at reanimating a story that reminds us that people can be truly tolerant—with the exception of the few—and that, with will (not money), anyone can effect change. Harvey Milk as seen through fresh, highly knowledgeable eyes." "Faderman's exploration of Milk's dual outsider status as gay and Jewish is equal parts warm and scholarly....Faderman's sensitive contextualization of his life illuminates that his great humanity, as well as his successes and failures, were very much entwined with his Jewish identity." 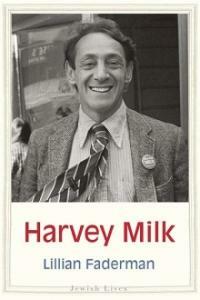 "[An] exemplary biography...Concise and beautifully written, Harvey Milk is an invaluable addition to LGBTQ literature." "This elegantly written and well-researched book recovers the Jewishness that has too often been erased or glossed over in the mythologizing of a gay icon."